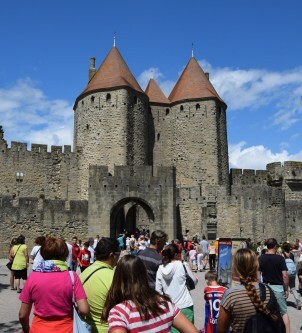 Welcome in Carcassonne’s Village Grand Sud campsite, located in Aude’s department, in Languedoc-Roussillon region, 10 kilometers from Carcassonne, famous for its legendary Medieval City and Canal du Midi, two monuments to UNESCO heritage. Nature is the asset of our campsite, raised and flowers with a capacity of 110 places over 11 hectares surrounded by a private lake where you can fish carp, white fish and relax near the Aude river. We are ideally located to discover the Cathare Country and its castles. Near Limoux, famous for his Blanquette, Castelnaudary for his Cassoulet, Narbonne for his beaches and only 1 hour to 2 hours of Pyrénées and Andorra. All the team of the Village Grand Sud is waiting to receive you in this privileged setting, a holiday setting where you will be nice, or you will be “you” !